Carey Bell may not have been the most famous harmonica player out of Chicago, but he was certainly one of the most inventive and most distinctive. He learned from the masters in the Windy City (Big and Little Walter and Sonny Boy Williamson II), but he added his own style to the mix, and when you heard him you knew right away that it was Carey Bell. Bell passed away in 2007, but he left four sons to carry on the blues tradition – Lurrie (guitar), Steve (harmonica), Tyson (bass), and James (drums). All four recorded with their father over the years as well and continue to perform today. 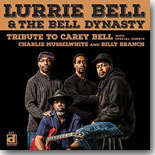 I have to admit that I got pretty excited when I received Lurrie Bell & The Bell Dynasty’s Tribute To Carey Bell (Delmark Records) in the mail a few weeks ago, and I also have to say that I was not disappointed upon giving the set a spin. The Bells are joined by guests Billy Branch and Charlie Musselwhite, along with guitarist Eddie Taylor Jr. and keyboardist Sumito “Ariyo” Ariyoshi on several tracks, as they work through a 12-song mix of original tunes and classics from their father (“Heartaches and Pain,” So Hard To Leave You Alone,” “Woman In Trouble”) , Muddy Waters (“Gone To Main Street”), Little Walter (“I Got To Go,” “Break It Up”), Big Walter (“Hard Hearted Woman”), Junior Wells (“What My Momma Told Me”), and Cleanhead Vinson (“When I Get Drunk,” also covered by their Dad). Branch, who teamed with Lurrie Bell in the earliest edition of The Sons of Blues band, appears on two tracks, providing vocals and harmonica on Carey Bell’s “So Hard To Leave You Alone” and his own “Carey Bell Was A Friend Of Mine.” On the former, Branch captures his mentor’s sound perfectly on the chromatic harmonica, and on the latter he and Steve Bell “battle” it out in a spirited head-cutting competition. Musselwhite adds hamonica to a fast-paced take on “I Got To Go,” and Ariyoshi provides keyboards on three track. Fans of Chicago blues simply cannot pass up this outstanding album. While it may be a tribute album to an artist who is no longer with us, it shows that the music Carey Bell made during his lifetime still has a lot of life within it, and there is still much to be heard from his talented offspring in the coming years.